Jonny Evans has spoken of his emotional journey as a Northern Ireland player, revealing the only time he cried on a pitch was playing for his country. 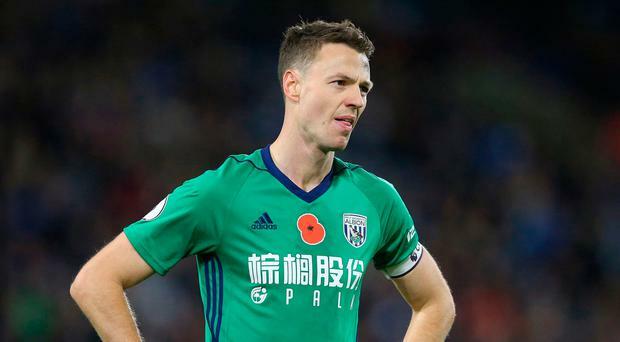 The West Brom captain, whose side were relegated from the Premier League last night by Southampton's win at Swansea, also remains haunted by Northern Ireland's failure to make it to back to back major tournaments. After their Euro 2016 adventure in France, Michael O'Neill's men were agonisingly close to qualifying for next month's World Cup in Russia but they suffered a play-off nightmare as Switzerland progressed and the Green and White Army cursed a shocking penalty call made by referee Ovidiu Hategan at Windsor Park. Irish FA chiefs also feared they would lose O'Neill as manager with Scotland keen to recruit the 48-year-old, but the former Shamrock Rovers chief opted to stay put. Evans, who claimed the International Personality of the Year prize at Monday's Northern Ireland Football Awards, spoke of his desire to make it to the century cap mark and why playing for his country means so much to him. "As time goes on and you think your career is coming to an end you appreciate more every cap you achieve and I want to get to 100 caps in as quick a time as possible and not be scrambling around to get it at the end of my career," said the former Manchester United defender who has 68 caps. "Every time you pull on the jersey you get emotional and playing for Northern Ireland is the only time I've cried on the pitch. It brings out certain emotions in you that you probably didn't know you had inside or they would come out. It's a real honour." Evans is now expected to leave the Baggies in the summer with Crystal Palace, Newcastle and Everton thought to be interested. Leicester City and Manchester City have had bids turned down for the player with even his old club Manchester United reported to be considering bringing him back to Old Trafford. At international level, O'Neill has been able to count on the player who was a class act at the Euro 2016 finals. "In the past people have won this award but Jonny is here to collect it and that says everything about his commitment," said O'Neill. "As a manager I've been very fortunate to work with senior players like Jonny, Steven Davis, Gareth McAuley and Chris Brunt. Top players from Northern Ireland never forget where they come from and Jonny and Jimmy (Nicholl) are both like that. "They understand what we have as a team." On his disappointing season with West Brom, Evans added: "Once the club made the decision to change manager there was the feeling we were going to be relegated but fair play to the lads and management, they gave us a chance to stay up." Evans also indicated that Albion's players want Darren Moore to be given the full-time job. Moore (left) won the April Manager of the Month after a remarkable five-match unbeaten run, which included wins over Manchester United, and Tottenham Hotspur, but it is the Championship for Albion next season. "He's a fantastic person and I think all the players at this moment in time would like to see him keep the job," Evans said. "But the club could go a different direction and us as players will have to accept whatever decision they're going to make." On his own future, before last night's result, he said: "I haven't thought that far ahead really. "For me, the most important thing is to try and stay in the league with West Brom and see where that takes us."